A recent article in the Niagara County section presented the Niagara Heritage Partnership idea for an extended greenhouse over the parkway lanes where they cross the gorge power plant. This is one of over fifteen projects related to parkway removal and the restoration of natural landscapes along the gorge rim. Other projects include the relocation of the State Parks maintenance buildings from the edge of the gorge to a more appropriate site, the construction of additional wheelchair and handicapped access points, and the reclamation of that part of Devil’s Hole State Park made inaccessible by the Power Authority access road. The NHP believes these projects and others listed at www.niagaraheritage.org (under “Terrorists, Casinos, Creating Jobs”) to be consistent with its advocacy for restoring the natural environment of the gorge rim. Of these projects, the greenhouse concept has the highest potential to both create jobs and to be a major tourist attraction and cultural contribution to our region, environmental, educational, and economic. It is undeniably ambitious; it requires studies of heat sources and other investigations; it calls for a creative, open-minded community willing to consider possibilities and opportunities. Yet the day the concept was introduced, simultaneously, in fact, Sandra Hayes, Richard F. Soluri, and David M. Fleck spoke in opposition. Hayes, director of the Greater Lewiston Business and Professionals Association, stated that NHP had submitted “various plans and dreams,” but the “best compromise would be to create various lookout points on the gorge side of the existing parkway for motorists to pull over and enjoy the view.” (Does she know about the NHP position paper on “compromise” and, if so, why doesn’t she respond to these specifics?) Hayes seems unaware that vehicle access “lookout points” already exist on the American side: at the Gorge Discovery Center, at Whirlpool and Devil’s Hole State Parks, the Power Vista, and at Artpark. She wants our side to be like the Niagara Parkway in Canada, and insists the parkway be kept as “expedient access” to the northtowns from Niagara Falls. Soluri, Mayor of Lewiston, says the greenhouse concept “is totally unrealistic.” Since, however, he proposes that the Power Authority pay for the construction of a pedestrian bridge over the Niagara River from Lewiston, New York, to Queenston, Ontario, he may not be the best judge of what’s realistic or unrealistic. Fleck, president of the Niagara Falls Hotel and Motel Association, touts the Canadian parkway model, too, saying it “would benefit the handicapped and elderly who aren’t able to walk across parklands and whose only opportunity to enjoy the vista is from vehicles.” He thus demonstrates his appalling ignorance of the NHP proposal which, from its onset six years ago, has incorporated vehicle access to the gorge rim for the elderly and handicapped and wheelchair users and, moreover, asks for additional access points for wheelchair users and the handicapped, and the retrofitting of existing ones. As pointed out repeatedly, The Injured Workers of New York, Inc. has endorsed the NHP proposal for parkway removal. Would the proposal have gained this support if the needs of the handicapped and wheelchair residents and visitors were ignored? Fleck, who owns the Howard Johnsons Hotel near the Falls, and who commutes on the parkway from his Youngstown residence, sometimes under the annoying sightseeing helicopters that fly from their home base at his establishment, is also extremely confused about Frederick Law Olmsted. 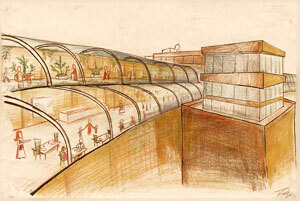 Fleck believes that the greenhouse concept, which has the potential to establish wide bands of greenery and flowering plants across the stark concrete of the gorge power facility, to be anti-Olmsted because the “greenhouse, restaurant, and all the rest of it would be a commercial project.” Even Frederick would be smiling and scratching his head trying to make sense out of that. As political and business leaders, Fleck, Hayes, and Soluri have special responsibilities to be informed on the issues about which they express opinions. Their elevated status gives weight to their remarks, which influences others. When they have the facts wrong or when they refuse to learn the facts, they do others a disservice. Perhaps they believe their elevated status exempts them from considering an issue before they condemn it, that they can say whatever pops into their heads, whatever is “expedient,” whatever they think will play well with some constituency. But they should know it doesn’t play well with the Partnership, and that we urge others not to be misled by their remarks, but to carefully consider the NHP arguments before making decisions about an issue that will impact our region for many years to come.